$1 from the purchase of this keychain goes to helping bring paid family leave to all 50 states. You're passionate about your work. As a partner, parent, son, or daughter (probably more than one of those) you're also committed to family. We think Vassie from Annapolis, Maryland said it best in her review of this this artfully industrial pewter keychain, which features a bead that slides between the etched words "work" and "life": "We each hold the keys to balancing our lives. This is the perfect reminder of that." We should all be able to balance the two, but most Americans can't afford to take time off to care for a new child or seriously ill loved one: Just four states make paid family leave a requirement in the workplace. $1 from the purchase of this keychain will go to Family Values @ Work—an organization that supports family-friendly workplace policies—and their efforts to bring paid family leave to all 50 states. Made in Lincoln, Rhode Island. Visit our interactive map to help make paid family leave happen where you live! Exclusive Design was established in 1965 by an artistic war vet who needed a job. Creatively Yours, their design partner, was started in 1992 as a place where its founder, Donna McKeown, could be creative and bring joy to people through gifts that celebrate their passions. You're passionate about your work. As a partner, parent, son, or daughter (probably more than one of those) you're also committed to family. 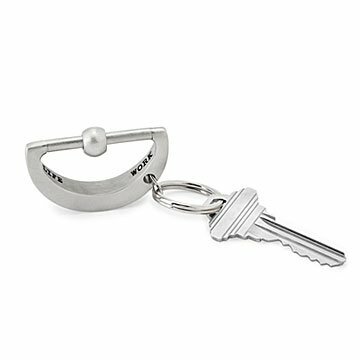 This artfully industrial pewter keychain inspires us to find balance in life, with a bead that slides between the the words "work" and "life," which are subtly etched into either end. Creatively Yours, design partner of manufacturer Exclusive Design, provides high quality, handcrafted gifts that support American businesses. Exclusive Design, the manufacturer, pays employees a starting wage of $11/hr., which falls within 10% of Providence County's living wage. Exclusive Design provides two weeks of vacation and holidays off, with five days paid sick leave. Scrap metal is remelted and reused. Packaging is made of recycled materials and is recyclable. Exclusive Design and Creatively Yours do not have charitable giving programs, but meet all other Collection criteria. Lead-free pewter, an allow consisting primarily of tin, a natural source material. Kraft boxes and paper are made from recycled materials and recyclable. There's one place—and only one place—where you'll find the Work/Life Balance Keychain: UncommonGoods. 2" L x .36" D x 1.2" W; 2oz. Much bigger an bulkier than anticipated. Ball moves freely, thought user could balance. This was the perfect gift for my TEAM at work. I have given this as a gift twice, both times to moms who seem to balance work and life seamlessly. It is a beautiful reminder of how challenging it is to balance work and life. Both women loved it. Great Product! Fast Shipping Time!!!! Beautiful piece and wonderful message. On my keychain to remind me multiple times a day that life is not just work. Noticed it just when it was needed for a dear friend. We each hold the keys to balancing our lives. This is the perfect reminder of that.